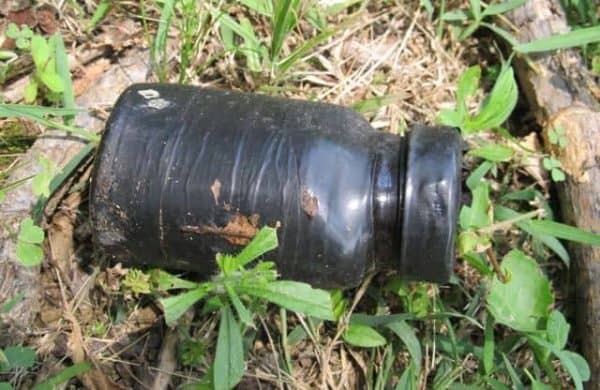 It’s Day 354 of “365 Things to do in Cincinnati” and today we’re featuring a great little “hide and seek”, treasure hunt kind of game you can do anywhere – Geocaching. New to Geocaching? You may also want to check out our Beginner’s Guide to Geocaching. 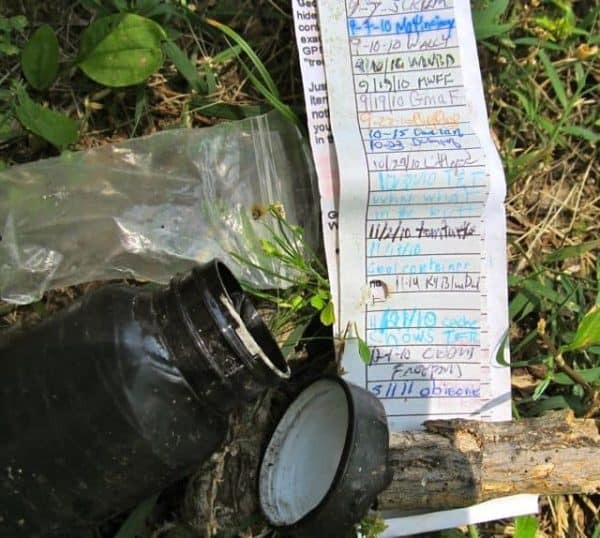 I started my day’s activity by asking the 365Cincinnati Facebook page readers , “What should I do today?” Facebook reader Elizabeth Hickerson said, “Go geocaching! It’s a great day for it.” so that’s exactly what I did! You might be wondering what the heck I’m talking about. 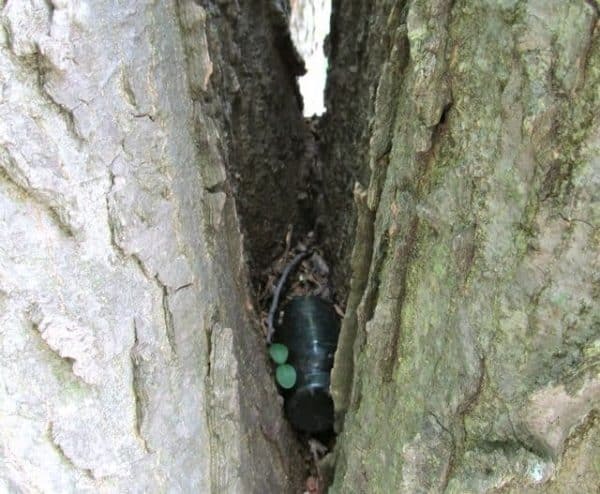 If you’re not familiar with the concept, geocaching is a high tech treasure hunting game. Basically, people hide “stuff” in a container and put in the coordinates online. Using a handheld GPS device. you try to locate whatever it was that they hid. You can log your hidden treasure (if you’re starting a new geocache hunt) online at the site (info below) or you can log in to get the details on something already hidden. As you can see from the picture above, my GPS of choice is my iPhone. I downloaded an app for my iPhone. I used Groundspeak’s app Cachly, an app for the iPhone, and really like it. At just $4.99 it will provide loads of entertainment for the whole family. There are apps for other GPS enabled phones available as well. Alternatively, you can use a handheld GPS unit (like the ones found here). On the app, I simply clicked on “find a geocache close to me”. After determining my location a list of geocaches came up. I was surprised to see so many within a mile of my house. I hopped in the car and started to follow the little arrow (see the arrow pic in my phone above). You can also plug your address in on the online site at Geocaching.com and it will give you a list of possible hunts near you. 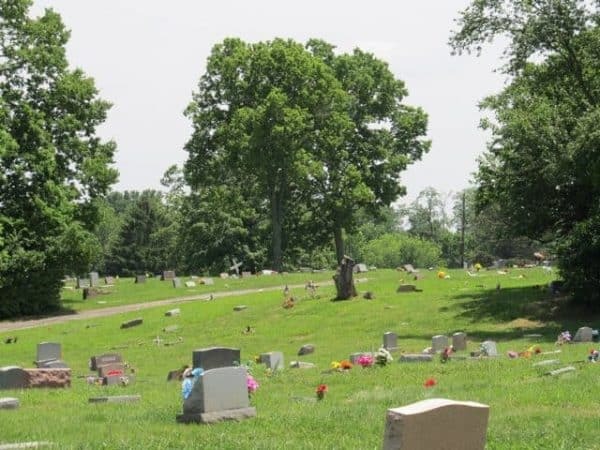 As you can see, my geocache was located near a cemetery – Beech Grove Cemetery to be exact. This cemetery is located on the edge of (or in?) Wyoming in Springfield Township on Fleming Road. I really couldn’t find much about the cemetery online. The person who started this geocache mentioned in the details that the cemetery is “one of the area’s oldest African-American cemeteries with some civil war veterans buried here.” I can not verify that’s true but there certainly are some old gravestones there and a number of them are soldiers. My phone and the geocaching app were ready to go and they were ready to lead me to the spot where the treasure was hidden. I parked and hopped out. It turns out that the hunt led me all the way across the cemetery, which was a very cool walk. It was a beautiful day to be out exploring. The app shows my location and the geocache’s location with a line of arrows in between (see the phone picture above for an example). As I got closer the two spots got closer. Lucious Love – what a great name! This particular geocache was in a Rubbermaid container (I learned that from the description on the site) and as I got to the edge of the cemetery I realized it was probably in the adjoining woods. I searched and searched and searched but came up dry. I got back onto my phone and clicked the “hint” button and also looked at the log for this hunt – both of which provided me some clues. I still didn’t find it. The container was placed over a year ago and I think perhaps it’s buried under ivy or brush by now or it’s been carried off. BUT, using the app I was able to click “find another geocache that’s close to me” and I found that there was another one hidden in the cemetery. So I decided to give up on hunt #1 and searched for hunt #2. This hunt was much more successful! My phone’s app led me right to the right area. Again, I hunted and hunted and didn’t see it. In desperation, I took a look at the hint which simply read “V”. Could it be in the crook of a tree? Yes, it was!!! Can you see the black plastic bottle hidden in there?! Success! It’s a brief description of what geocaching is stapled to a log where you can add your name to the bottom. Can you see the long list of people who’ve found this one?! The list was in a tiny little zippered plastic bag inside the container. I gently put it all back in, screwed it shut and placed the bottle back in the tree for the next person to find. What fun! Now I’m going to go log my notes about NOT finding the other one in hopes that it will help another hunter. Geocaching is a great hobby – one you can do alone, with a family (GREAT for kids), or as part of a group. There are geocaches hidden all over the WORLD. I have been wanting to try Geochaching for a long time! I just recently found out there were indeed places around the Cincinnati/Northern KY area. I can’t wait for the weather to warm up to try it! Karen, I hope you’ll try it this year! We recently started hunting for geocaches while we travel too. It’s a great way to break up a long ride and gives us something free to do at our destination as well.